I have purchased a new bed and bedspread, so in turn I have to redecorate my bedroom to reflect the new style. I went from brown tones to black, so it was a great opportunity to create some new art work. I wanted to do something unique but also cheap. I purchased various frames from T.J. Maxx Home, Michael’s, JoAnn’s, and Kohl’s – all under $8.00 – and bought some scrapbook paper to put in the frames. I think it turned out pretty nice and is a completely new look for my bedroom. 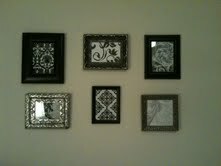 Now if only I could paint the walls and somehow keep the frames straight…..hopefully in my next home.